I began to write this book because I felt a sense of injustice and bitterness at all the failure that I had experienced in my life. But as I got further into the writing of this book I began to realise just how many experiences I could actually share with others and hopefully, be able to help others just a little, to come to appreciate their lot in life. I was born into a military family in 1953. My Father was in the RAF, my Mother was a nurse. My sister and I had a strict upbringing which in some ways I am glad of. I suffered greatly with lack of self esteem and confidence which was extremely debilitating and led me into all sorts of farcical situations many of which were actually dangerous. Enduring an almost nomadic life as a Forces child I found it very difficult to engage with others and though I have largely got over this, even today I find it difficult to form relationships. Much of my story covers my life as a child as one would expect from an autobiography. Brought up in an era where “health and safety” issues largely did not exist it made for an exciting and eventful childhood to say the least. A posting to Singapore for two years was an adventure and possibly the best part of my young life. Singapore was a totally different place in the early 1960’s to what it is today. For a young boy it was exciting and we got up to all sorts of things. I often wonder how I survived that period without mishap. My Father always in control, was intent on “making a man” of me and as such entered me into a Nautical Collage called the Indefatigable when I was 14 which was situated in North Wales. Unfortunately, this collage was more of a borstal unbeknown to my parents. Strangely enough my Grandfather, though mentally ill, knew this but was ignored because of his condition no doubt. The Indefatigable was a harsh place run on military lines into which I did not fit yet I have a soft spot for the place today. I suffered the most horrendous homesickness here. Entering the Merchant Navy at 16 as a Deck Boy on my first ship, the Canberra Star, I was out of place like a fish out of water but had many adventures on my subsequent travels round the world and a steep learning curve. I would run for home at the slightest opportunity and this is why the book is entitled “Running For Home”. Indeed at one point I became a Psychiatric Nurse in the very asylum in which my Grandfather had spent time. This, for a while at least, enabled me to remain at home but the call of the sea came back to me and the Merchant Navy and Shell Tankers. It wasn’t long before I joined the Royal Navy, first as a radio operator, then as helicopter aircrew. This was a particularly farcical period and it was almost miraculous as to how I was able to pass the course. This led to some very dangerous and expensive moments. During the Falklands war I was engaged as a Military Policeman but left the services shortly afterwards. This was a strange period of time where my wife and I lived in Malta on a shoestring for two years but again it was to be a tumultuous time. On return to the UK I could not find employment so started my own business as a window cleaner. 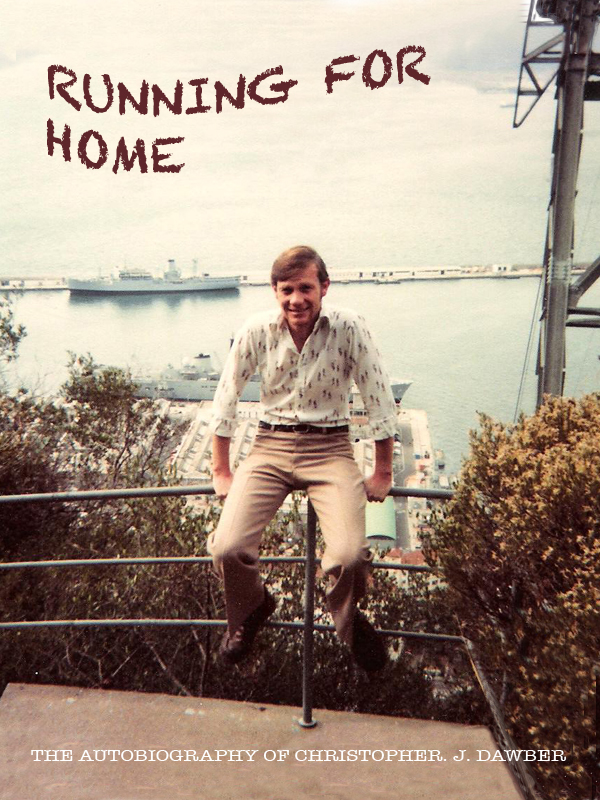 This had its own form of humour and adventure which you can read about in the book, “Running For Home”.